I just can't get enough of Christmas gifting this year and there is so much more to come! Nails Inc has some gorgeous sets available for this year and I definitely want to get my hands on one or two of them. I have also included this weeks star gift at boots - who doesn't love a bargain! Beauty of Dreams £20 (Originally £40): This is one of the first star gifts for 2017 and it's a good deal! You get two nail polishes, two lip products, a peel off mask and two sheet masks! Face Inc By Nails Inc Joyful Skin Pods £18: Comes with five masks, I love that they are all individual uses. Face Inc By Nails Inc Fairy Tale of Sheet Masks £10: Includes three sheet masks, I am most excited about the Oh Deer! one. Sparkle All the Way Bauble £10: Inside the bauble is a lip product and a mini nail polish. The Fairytale of Good Skin Gift Set £19: Comes with five sheet masks. 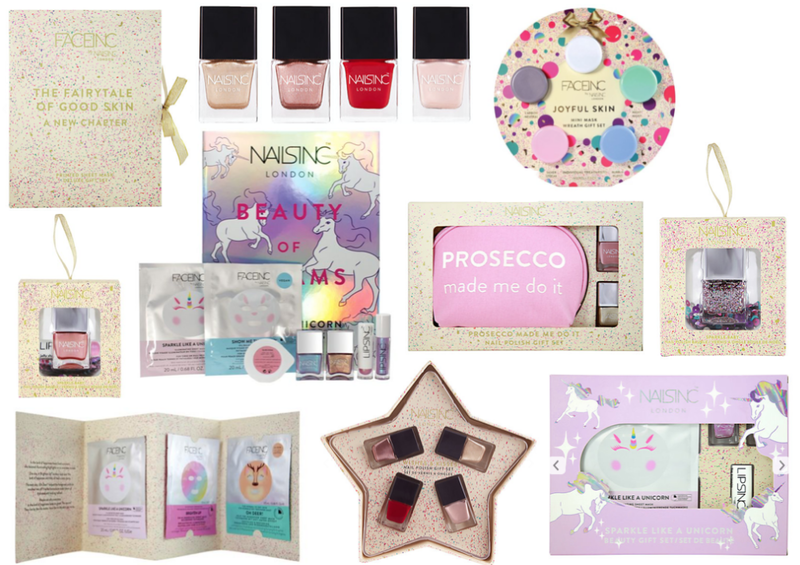 Sparkle Like A Unicorn Beauty Set £19: Includes two mini nail polishes, a lipstick and the Sparkle like a Unicorn sheet mask. Prosecco Made Me Do It Nail Gift Set £20 (Exclusive to John Lewis): Includes two full-size nail polishes and a gorgeous pink makeup bag. Sparkle Baby Bauble £15: Comes with a gorgeous glitter polish to get your nails ready for the party season! Wishes and Kisses Gift Set £19: A star-shaped gift set with four mini nail polishes inside.